Caught in only modest quantities for centuries, the minke whale was largely ignored until the late 1960's, when the great baleen whales were all but wiped out. Thousands of minke whales were taken annually until the global moratorium on whaling in 1986, after which Japan continued to hunt minkes for what they claim are scientific reasons. Current minke whale population estimates vary from over 700,000 to less than 300,000. Today they're hunted by Iceland, Norway and Japan, whose annual quota is now 935 whales. COMING SOON: The Miniature Minke: As whales go, the minke whale -- at 20 to 30 feet long and weighing 6-8 tons -- is a relative pipsqueak. Find out more. 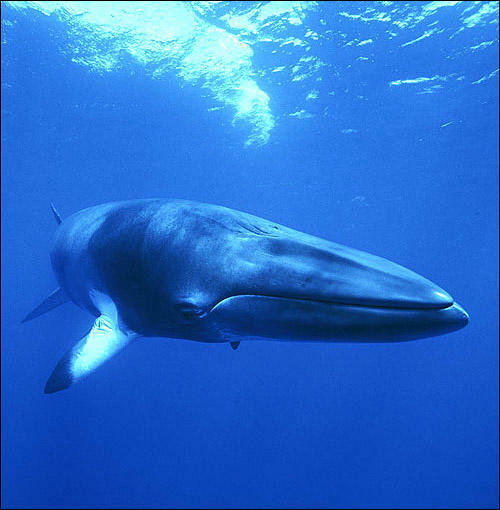 COMING SOON: The Science of Minke Whales: Why are minke whales the subject of Japanese scientific whaling? Find out what Japan says they hope to discover. COMING SOON: The Suffering of the Minke Whale: Given what scientists have learned about whale intelligence in recent decades, the issue of humane killing is of primary concern to many. Find out what happens when today's most commonly hunted whale is harpooned.